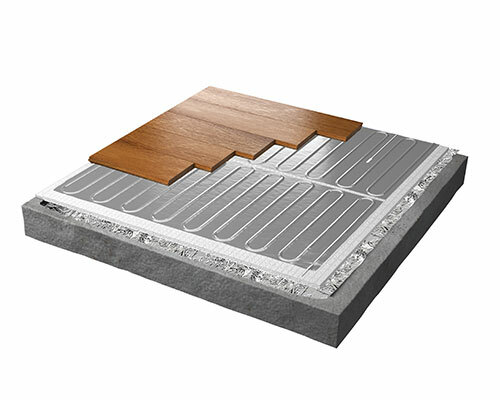 Foil underfloor heating is an ideal heater for larger areas and for use with floating floors such as laminate, vinyl, engineered wood, and carpet. Simple to install, the Foil Heater delivers a consistent heat distribution with the thermal properties of the reinforced aluminum foil used in the heater helping to spread the heat evenly. Comes with a 15-Year warranty. No – the foil heater is designed for use under floating floors only. Tiles are fixed to the sub floor using tile adhesive and a suitable system will be required such as the DWS, SPM (Stickmat) or the DCM-PRO system. Click here for further information on these systems. No – the Foil Heaters are completely earthed, and can be installed without any additional grounding nets. The foil layer acts as a continuous earth and it is important that it is kept intact. See the foil installation manual for further information. Yes, but all heaters being controlled by thermostat must be installed within the same room/zone. Each thermostat can control up to 16 amps of heating and maximum of two heaters can be wired directly into the back of the thermostat. If installing more than two heaters connect in parallel via a junction box.